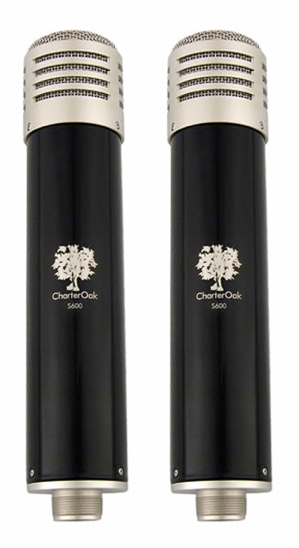 The CharterOak Acoustic Devices S600 is a front address vacuum tube condenser microphone. Delivered in sequentially numbered pairs with a lockable fight case, dual power supply, and two shock mounts and is extremely well suited for stereo recording. The S600, like all CharterOak products, features extremely rigid construction and a clean and simple electronic design. The CharterOak S600 uses a custom made side terminated 1.00″ gold sputtered Mylar capsule and custom made output transformer. Its rich and particularly non-sibilant eq make it a perfect choice when used as a stereo overhead pair on the drum kit. The result is clean and rich cymbals with lots of sustain while picking up all of the transient peaks of the snare and tom toms. The extended bass frequency response of the S600 makes a single S600 a perfect choice for recording bass guitar and its particularly smooth treble response makes it a perfect choice for recording bright electric guitars. It is hard to imagine a more versatile tool in the studio than a pair of CharterOak S600 vacuum tube condenser microphones.